Mary Mar Keenan is a San Francisco ceramic artist working in porcelain and stoneware. "My work is typically full of color and spontaneity, yet my forms are controlled and concise. I do my best to reflect the beauty of the nature that is around me both in the clay itself and within my glazing techniques. The possibilities are endless and for that I am grateful," she says. Working out of her Hayes Valley studio, Mary Mar has produced tableware for an array of top-tier restaurants in the Bay Area and other cities in the U.S., including Nightbird (Kim Alter's new restaurant, opening in SF in 2016), Single Thread Farms (Michelin Star contender, opening in May/June 2016 in Healdsburg), A16 (SF and Rockridge), Octavia (SF), BearCat (New Orleans - opening in 2016), Wildhawk (SF), BirdDog (Palo Alto) and Alloy (Miami). In 2014, she designed and produced a collection of work for Stuart Brioza's (James Beard Award Winner Best Chef: West) most recent venture, The Progress. From this collaboration The Progress Collection was developed and has been featured in Food and Wine magazine, Remodelista, Saveur and San Francisco magazine. "Plating food can be an art form and my tableware is meant to be the canvas. 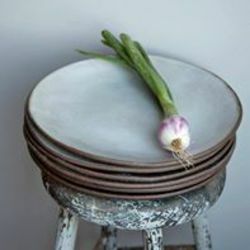 The weight and feel of handmade tableware lends substance to the experience of a meal. Further, by drinking from a handmade cup or eating from a handmade plate, there is an unspoken deep understanding and compassion around the pottery and its maker. It is this quiet conversation that drives me to continue making work while continuing to honor one of the oldest and purest industries to ever exist." "While most of the pieces are handmade using slabs of clay, there are a number of wheel-thrown pieces adding unique shapes within each series. I offer seven different glazes, making it possible for clients to customize their sets and be uniquely involved in the creative process." "All of my glazes are made in small batches in my studio, hand brushed and fired to nearly 2300 degrees farenheit in an updraft gas kiln. While I aim to maximize the amount of oxygen in the kiln, it is difficult to always control the atmosphere. No two pieces are exactly alike. I celebrate these variations in my work." Interior by Jamie Bush + Co.